How do I connect the Razer Ifrit headset to my PC? You can connect the Razer Ifrit via the 3.5mm combo cable to any standard 3.5mm combo jack. However, to get the full benefits of the Ifrit you will need to connect the Razer Ifrit using the enclosed Razer USB Audio Enhancer. To connect the USB audio enhancer simply plug the Ifrit's 3.5mm cable into one side of the enhancer and the other to any available USB connection on your computer. Please be sure you set the Ifrit as the default playback and recording device of your computer. How do I clean my Razer Ifrit headset? We cannot say with certainty what type of dirt and debris may be on your product, or how certain cleaning products may react with it, but we have had good luck cleaning Razer products using commonly available monitor cleaning wipes. To clean the body of your Razer headset please take a monitor wipe and use gentle wiping motions. Do not scrub the surface of your Razer headset. I plugged in my Razer Ifrit and I can’t hear surround sound, what should I do? Please ensure that the "Razer Ifrit" is set as your default recording and playback device on your computer. How do I wear the Ifrit headset? What if the ear-tips that come with the Razer Ifrit do not fit, are there different sizes available? To help ensure proper fit, the Razer Ifrit includes 3 interchangeable ear-tips in varying sizes. What does the Audio Enhancer that comes with the Razer Ifrit do? The Razer USB Audio Enhancer is an analog to digital converter that takes audio quality up a notch while reducing static and background noise. The converter also enables two people to speak through one device—just plug in an additional 3.5mm headset to the USB Enhancer to start co-streaming. is Ifrit headset supported in Synapse? No, the Ifrit is not supported in Synapse. Why is the Razer Ifrit's microphone not transmitting my voice? Please ensure that the microphone is not muted in your operating system and that the Razer Ifrit is selected as the default recording device in the Audio Control Panel of your computer or in the Software Microphone Options. Why is the Razer my Ifrit not producing sound? Please ensure the Razer Ifrit is not muted in your operating system and that the headset is set to be the default playback device in the Audio Control panel of your computer or in the Software Audio Options. 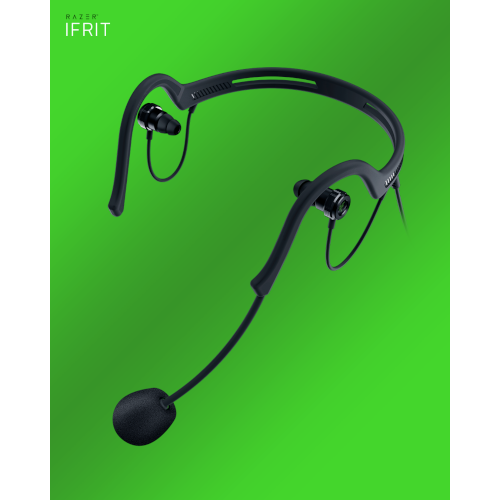 Will the audio enhancer that comes with the Razer Ifrit work with other headsets? Yes, the Razer USB Audio Enhancer will work with other headsets as long as the headset has a 3.5 mm audio jack. I lost my Razer Ifrit's audio enhancer, can I buy it separately? Yes it can be purchased separately , please go to our accessories store here. How do I connect the Razer Ifrit headset to my smartphone? You can connect your smartphone by simply using the Ifrit's 3.5mm combo cable. If your phone has no 3.5mm port, plug the Ifrit into the DAC (Digital Analog Converter) that comes with your smart phone. Please Note: The Razer USB Audio Enhancer does not work with smart phones. How do I stream with the Razer Ifrit on my Smart Phone? Streaming with the Razer Ifrit on your smart phone will require third party software. We suggest using Streamlabs Mobile Streaming Platform. Can I adjust the Razer Ifrit to fit my head? Stretch the Ifrit's neckband gently apart before placing the neckband’s ear hooks over your ears. You may then bend the headset’s microphone until it is in front of your mouth. You can make slightly adjustments with the Ifrit by gently bending the Ifrit to suit your head shape. However, this is not advised as bending the Ifrit band might cause permanent damage to the product. All you have to do in plug in another Ifrit or 3.5mm Headset into the included Razer Audio Enhancer which has two 3.5mm audio jacks. How does Razer Ifrit's dual streaming work? The converter enables two people to speak through one device—just plug in an additional headset to start co-streaming. Is the Razer Ifrit foldable/collapsible for easy storage? No, the Ifrit does not fold or collapse. What is this Flat Frequency Response feature on Razer Ifrit? Being able to accurately hear yourself while broadcasting ensures you’re constantly on top of your game. With flat frequency response, you’ll always know exactly how you sound like to your viewers. I lost my Razer Ifrit microphone foam cover and/ or ear tips, can I purchase a replacement? No, we are sorry but these are not available for purchase. What is the sound pickup pattern on the Razer Ifrit's condenser microphone? The Razer Ifrit is equipped with a Pro-grade adjustable condenser microphone with a Cardioid pickup pattern. Does the Razer Ifrit come with a braided cable? No, the cable is not braided on the Razer Ifrit.